A new report by Persistence Market Research on the global auto infotainment market analyzes market opportunities and presents updates and insights pertaining to various segments of the global auto infotainment market over an eight-year forecast period 2016–2024. The report analyzes the global auto infotainment market in terms of market value and volume and provides information on the key market dynamics, value chain analysis, competition landscape, pricing analysis, and other qualitative analysis frameworks, including market attractiveness analysis, absolute $ opportunity analysis, and Y-o-Y growth comparison by segments in order to support stakeholders for decision making and market analysis. To understand consumption patterns and assess opportunities in the global auto infotainment market, the report is categorically divided into different sections based on market segmentation – by systems, by vehicle type, by sales channel, and by region. The report begins with an overview of the global auto infotainment market followed by a detailed analysis of the key drivers and restraints likely to influence the market. Key trends observed across the global auto infotainment value chain are also included in this section. The report highlights existing opportunities in the global auto infotainment market to equip readers with useful decision-making insights. 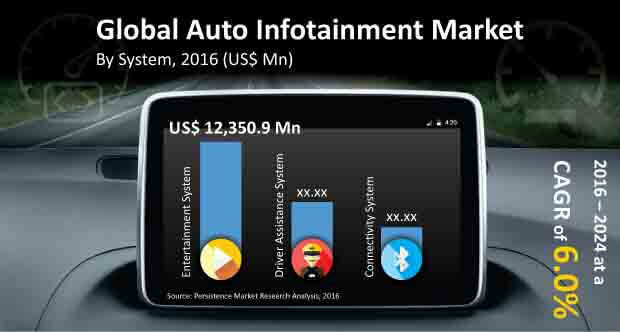 The subsequent sections analyze the global auto infotainment market on the basis of entertainment system, connectivity, driver assistance, vehicle type, sales channel, and region and present a comprehensive forecast for the period 2016–2024. The final section of the global auto infotainment market report covers a detailed competitive landscape to provide a dashboard view of key players operating in the global auto infotainment market including manufacturers, retailers, and distributors. The report highlights recent developments, strategies, and SWOT analysis of key market players active in the global auto infotainment market. The report on the global auto infotainment market profiles the following market players – Continental AG, DENSO Corporation, FUJITSU TEN Limited, HARMAN International, Delphi Automotive LLP, and Garmin Ltd.
To deduce the market size, the report considers various aspects based on secondary research. Furthermore, key data points such as region wise split and market split by entertainment system, connectivity, driver assistance, vehicle type, sales channel, and by region; and qualitative inputs from primary respondents have been incorporated to arrive at appropriate market estimates. The forecast presented in the report assesses total revenue generated and expected revenue contribution of the global auto infotainment market. The report begins by sizing the market in terms of value and volume. This forms the basis for forecasting how the global auto infotainment market is anticipated to take shape in the near future. Given the characteristics of the market, gathered data is triangulated via different analyses based on supply side and demand side drivers and other dynamics of the global auto infotainment market. To develop the market forecast, Persistence Market Research has also conducted a factor analysis to understand the impact of various forces/factors on the target market. Given the ever-fluctuating nature of the economy, the report provides market forecasts not only in terms of CAGR but also analyzes the global auto infotainment market on the basis of key parameters such as Year-on-Year (Y-o-Y) growth to understand the predictability of the market and to identify the right opportunities in the global auto infotainment market. Another key feature of this report is an in-depth analysis of the global auto infotainment market and the corresponding revenue forecast in terms of absolute dollar opportunity, critical in assessing the level of opportunity that a provider can look to achieve, as well as to identify potential resources from a sales perspective in the global auto infotainment market. To understand key segments in terms of their growth and performance in the global auto infotainment market, Persistence Market Research has developed a market attractiveness index with the objective of helping providers identify existing market opportunities in the global auto infotainment market. Auto infotainment systems have undergone a gradual innovation and multiple inventions and have metamorphosed from mere “music only consoles” to encompass an entire range of applications that help automobile drivers and passengers to stay connected with the surroundings outside the vehicle and with entertainment within the vehicle while on the move. With a rise in accidents and inherent security issues, automobile manufacturers and auto infotainment manufacturers are implementing various technologies such as self-dial emergency numbers during accidents, vehicle tracking systems, connected cars, etc., which are being integrated into the dashboard of automobiles. Such technological revolution is pushing the global auto infotainment market towards a sustained growth path. The global auto infotainment market is estimated to grow 6.0% globally over the forecast period and is anticipated to reach a market valuation of US$ 31.96 Bn by 2024. Factors such as growth of the automotive sector along with rising consumer inclination towards an entertaining driving experience, rise in compact passenger car sales, and increasing demand for vehicle customization among youngsters are factors expected to significantly impact the growth of the global auto infotainment market. Some of the other factors fueling the global auto infotainment market growth are increased consumer spending on luxurious items, rising awareness of safety and security in automobile functioning, and an increasing penetration of smartphones and their active role in the day-to-day life of individuals. However, drivers’ distraction in handling auto infotainment systems while driving and economic crisis in certain regions leading to a subsequent fall in the sales of vehicles are factors likely to restrict growth of the global auto infotainment market during the forecast period. The global auto infotainment market is segmented on the basis of System Type (Entertainment System, Connectivity System, Driver Assistance System); Vehicle Type (Passenger Cars, Light Commercial Vehicle, High Commercial Vehicle); and Sales Channel (OEM, Aftermarket). The Entertainment System type segment is estimated to be valued at US$ 13.50 Bn by 2016 end and is expected to register a value CAGR of 4.6% during the forecast period. The Passenger Cars vehicle type segment is estimated to register a CAGR of 6.8% over the forecast period. The Passenger Cars segment is anticipated to register a higher CAGR as compared to the Light Commercial Vehicle segment. The Aftermarket sales channel segment is likely to exhibit a higher CAGR in terms of value as compared to the OEM sales channel segment. The OEM segment is estimated to account for 79.8% value share by the end of 2016 and is expected to register a CAGR of 6.2% over the forecast period. The global auto infotainment market is segmented into five main regions – North America, Latin America, APAC, Europe, and Middle East & Africa. North America is estimated to account for a market share of 26% of the global auto infotainment market by the end of 2016. The APAC auto infotainment market is projected to exhibit a CAGR of 5.9% over the forecast period and account for 26.3% value share by 2024. The Europe auto infotainment market is projected to register a CAGR of 5.4% in terms of value over the forecast period and account for a share of 19.3% in the global auto infotainment market by the end of 2024. Continental AG, DENSO Corporation, FUJITSU TEN Limited, HARMAN International, Delphi Automotive LLP, and Garmin Ltd. are some of the top companies operating in the global auto infotainment market. Leading market players are looking to expand their existing production facilities in emerging markets and are making strategic investments in technological innovation and R&D initiatives to increase brand equity. Companies are also focusing on diversifying their product portfolio and are moving away from single sales channels to increase market growth and profitability.